Spot prizes, Mar3ini cocktails and a whole lot of science! 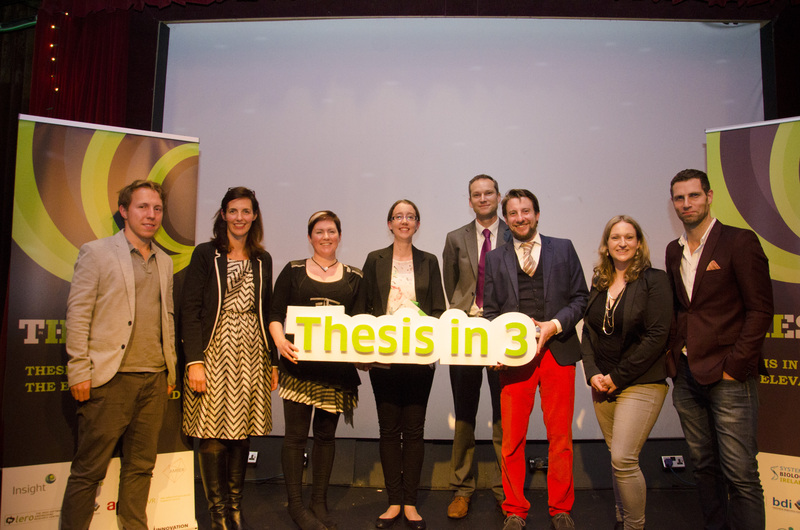 On Monday evening, the salubrious surrounds of the Sugar Club in Dublin hosted the fifth annual National Thesis in 3 Final. Audience members at this highlight of the science communications calendar were treated to a showcase of research work from around Ireland, hosted by the magniloquent Jonathan McCrea (Future Proof and the Science Squad). This fun and informative event is aimed at the general public, creating an open forum for anyone to get an insight into the world class research being carried out in Ireland today. As with previous events, students present their Masters or doctoral research in the Thesis in 3 format. This means that speakers communicate their work in a series of concise, rapidly-paced talks consisting of 3 slides of exactly 1 minute each, a tough task for even the most skilled presenter. 20 postgraduate students excelled in describing their cutting edge research to a packed house of 250 people and to the judging panel consisting of Will Goodbody (RTÉ Science correspondent), Claire O’Connell (Irish Times) and Margie McCarthy (Science Foundation Ireland). The presenters were judged on the content, clarity, and charisma of their presentations, with prizes awarded for the top three speakers as well as an award for the audience’s favourite. This year’s overall winner was Jennifer Gaughran from the Biomedical Diagnostics Institute in DCU with her talk ‘Spinning a Yarn: Quick and Easy Disease Detection’. Jennifer performed her presentation poetically in rhyming couplets, winning over the judges with her innovative and enthralling explanation of her research. Other winners on the night included Ruairi Robertson (UCC) and Aoife Murphy (UCD) with Darragh Whelan (UCD) picking up the audience choice prize. The event was recorded with edited videos appearing shortly on the Thesis in 3 YouTube channel. 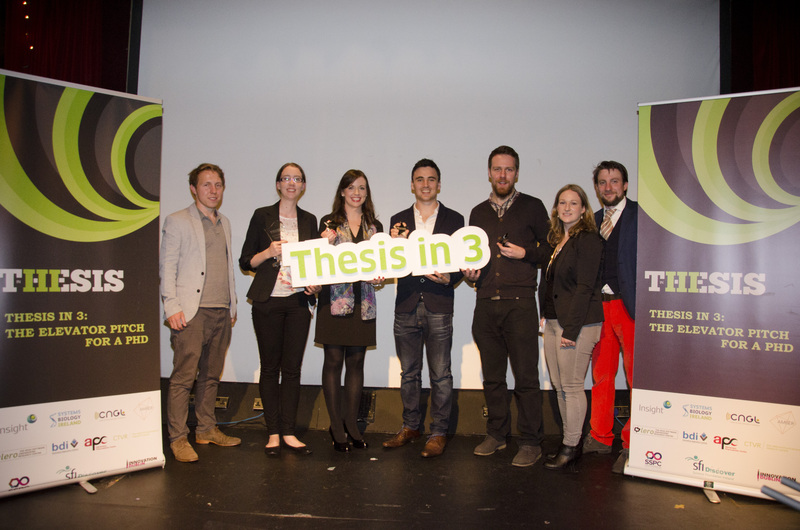 For further information please visit the website:www.thesisin3.com Thesis in 3 is sponsored by the SFI Discover Program and co-organised by Dr. Aoibheann Bird (Insight Centre for Data Analytics), William Fitzmaurice (Systems Biology Ireland) and Philip Smyth (UCD).